The first day of November. The first day of Diabetes Awareness Month. With all these ONES, I had trouble deciding what to write about! Should I write about how we, in the DOC, are ONE community? How although we are different, it's what unties us that makes us stronger. How we all share ONE goal. A CURE for diabetes. Should I write about how important ONE voice can be? About how sometimes we feel so alone. We feel that we are but one small story in this epic battle. Sometimes we feel that our voice won't matter. When, in reality, ONE voice is all it takes. My ONE voice. Your ONE voice. His ONE voice. Her ONE voice. Our voices unite to create something much bigger than we could ever be alone. Well, I kind of already wrote about that. You can read it HERE. So, I decided to focus on ONE in a different way. I'm planning on posting ONE fact about diabetes on facebook and twitter every day in November. I realize that people might get a little tired of this. I realize that people might get a little irritated with all of my posts about diabetes. 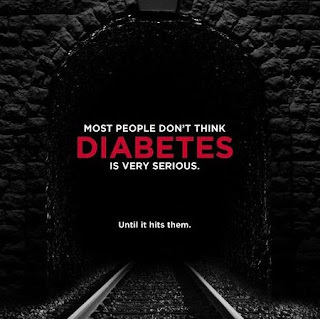 "Today, November 1, marks the first day of Diabetes Awareness Month. As a way of advocating and raising awareness about type 1 diabetes, I will be posting one fact about diabetes every day in November. I realize that some of you might get a little tired of seeing all of my diabetes related posts. Should you begin to feel that way, please think of my daughter and all the other people who battle type 1 diabetes daily. Every day they must test their blood sugar 7-10 times. Every day they must inject themselves with insulin. Every day they must count every carbohydrate that passes their lips. And they get really tired of it. While I will stop posting at the end of the month and you can choose to stop reading whenever you want, people with type 1 diabetes don't have the luxury of ignoring this disease. They must face this disease head on, every single day in order to stay alive and healthy. Every day - until there is a CURE." Here is a list of the 30 facts I will be posting. Feel free to use them as you wish! 1. Type 1 Diabetes is an autoimmune disease in which the body's immune system attacks and destroys the insulin producing cells in the pancreas. 2. No one knows exactly what causes type 1 diabetes. However, it IS known that it is NOT caused by poor diet or lack of exercise. Scientists believe that both genetic and environmental factors are involved. 3. Type 1 diabetes, sometimes referred to as Juvenile Diabetes, can strike at ANY age. 4. Type 1 diabetes can occur suddenly and causes a dependence on insulin for life. 5. To stay alive, people with type 1 diabetes must take multiple insulin injections daily or continually infuse insulin through an insulin pump. 6. People with type 1 diabetes must test their blood sugar 6 or more times a day by pricking their fingers. Sweetpea's fingers look dirty - but when you look closer you see tons of tiny holes. 7. While trying to balance insulin doses with food intake and daily exercise and activities, people with type 1 diabetes must still always be prepared for serious hypoglycemic (low blood sugar) and hyperglycemic (high blood sugar) reactions which can be life threatening. 8. While insulin injections or infusions allow a person with type 1 diabetes to stay alive, insulin does NOT CURE diabetes. 9. No matter how diligent a person with type 1 diabetes manages their disease, bad things can still happen. Simply injecting insulin and counting carbohydrates does not necessarily prevent complications. 10. Complications of type 1 diabetes include: kidney failure, nerve damage, blindness, amputations, heart attacks, stroke, and pregnancy complications. 11. Other factors that affect a person's ability to tightly control their diabetes include: stress, hormonal changes, periods of growth, physical activity, medications, illness, infections, and fatigue. 12. 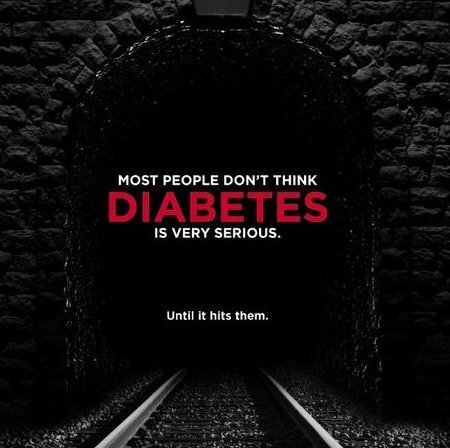 As many as 3 million Americans have type 1 diabetes. 13. Each year, more than 15,000 children and 15,000 adults - approximately 80 people per day - are diagnosed with type 1 diabetes in the United States. 14. The warning signs for type 1 diabetes include: extreme thirst, frequent urination, drowsiness, lethargy, increased appetite, sudden weight loss, sudden vision changes, sugar in the urine, fruity or sweet odor on the breath, heavy or labored breathing, seizures, stupor or unconsciousness. 15. World Diabetes Day is celebrated on November 14 every year. It is an official UN World Day. This date was chosen because it marks the birthday of Frederick Banting who was credited with the discovery of insulin. 16. The logo for World Diabetes Day is the blue circle. This circle is the global symbol for diabetes. The circle symbolizes life and health. The color blue symbolizes the unity of the global diabetes community in response the to diabetes pandemic. 17. In other countries, lack of insulin in the most common cause of death in a child with diabetes. The life expectancy of a child who has just developed diabetes could be less than a year. In some parts of the world, people do not have access to insulin and medical care. Visit LIFE FOR A CHILD to make a difference. 18. In 1922, the first human patient was injected with insulin. This saved his life. Before insulin, a person with diabetes rarely lived over a year after diagnosis. 19. The earliest reports of diabetes were from 1500 B.C. 20. Diabetes not only affects a person physically but also mentally. When blood sugar is not in range, a person can have difficulty concentrating and remembering information. This has very serious implications for children in school and adults in the workplace. 21. Diabetes can result in Dead in Bed syndrome. This is when a person with type 1 diabetes is found dead in the morning in an undisturbed bed after having been observed in good health the day before. No cause of death can be established. This is why many parents with CWD's never sleep though the night. 22. People with type 1 diabetes can EAT ANYTHING THEY WANT!!! As long as they bolus insulin appropriately based on the number of carbohydrates in the food, nothing is off limits. People with type 1 diabetes should follow the same diet as those without. 23. People with type 1 diabetes can DO ANYTHING they want! Diabetes does not have to hold a person back from achieving their dreams. 24. Famous People with Type 1 Diabetes: Bret Michaels, Mary Tyler Moore, Crystal Bowersox, Nick Jonas, Anne Rice, Sonia Sotomayor, Jean Smart, Elliott Yamin, Gary Hall Jr., Jay Cutler, Nicole Johnson, Brandon Morrow, Phil Southerland, Kelli Kuehne, Kris Freeman, Scott Verplank, Carling Coffing, Charlie Kimball, and more! 25. Type 1 diabetes is an autoimmune disease in which the body's immune system attacks itself. A person with type 1 diabetes is unable to produce insulin. Type 2 diabetes is a metabolic disorder. In type 2 diabetes, a person is either unable to produce enough insulin or is resistant to the insulin produced. 26. Early diabetes consisted to TASTING URINE to see if it tasted "sweet". Wow. I'm really glad blood sugar meters were invented!! 27. In diabetes, glucose in the blood can not move into the cells so it stays in the blood. This not only harms the cells that need the glucose for fuel, but it harms organs and tissue as well. 28. Diabetes affects every single organ system in the body. 29. Sugar in your blood is like shards of glass scraping your arteries. The scrapes will heal with scar tissues that causes blockages. These blockages lead to amputations, neuropathy, heart attacks, stroke, and kidney failure. 30. Today's fact is personal. Diabetes changed our lives. I am continually humbled by this disease and I continually stand in awe of the bravery and grace with with Sweets handles it. Although it is very possible to live a very GOOD life with diabetes, I'd gladly take this disease on for her if I could. I'd do it in a heartbeat. But since I can't, I'll do whatever it takes to find a CURE. Thank you for sticking with me these past 30 days! First thing I thought of this morning was getting November awareness month going on facebook! Im stealing your intro to the month...AGAIN! Love ya, you are an awesome advocate!!! Love your blog. We have a facebook page for our walk team and I will definitely be using this for daiily posts on that page. These are great! I will be using them on my FB & twitter. Thank you! Great post and great information Hallie!